Step 1. Cut a rectangle from cover paper. Roll to create a cylinder. Glue the long lengths together. Step 2. Fringe around both ends of the cylinder. Step 3. Trace around one end of the fringed cylinder on to the cover paper. Cut out this circle and glue to the fringed end. Step 4. Glue the other fringed end to the paper plate. Step 5. 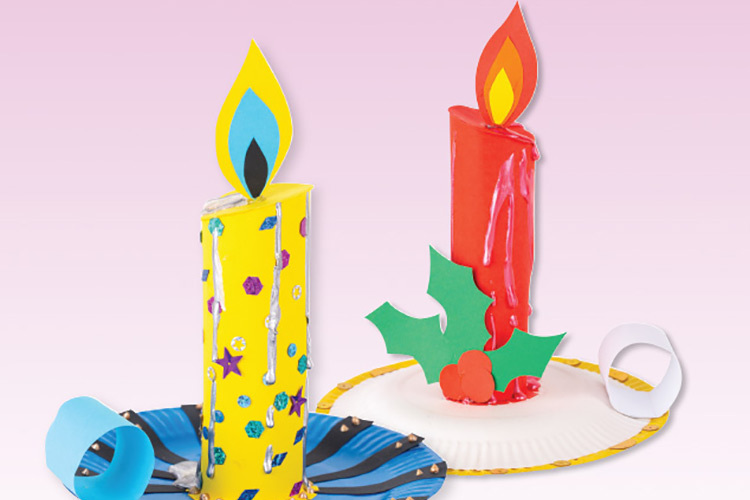 Cut out a flame from the cover paper and glue to the top of the candle. Step 6. Cut a small rectangle from cover paper and roll up to create a handle for the plate. Glue to the plate. Step 7. Decorate the paper plate with sequins and cut cover paper shapes. Step 8. Use the pearl pens to show dribbled wax running down the candle.